One thing I always discover (again!) when I work on a Tridion project, is the lack of release management. We develop new schemas, templates, edit existing ones and maybe create (config)components. Developers have to keep track of all these changed items, because when the release/project/fix is ready, it has to be installed on the other Tridion servers. Normally I kept track of the changed items using an excel sheet. But boy is that tedious. After finishing development we always use Contentporter to port the new/edited items to the next environment. So I print the excel-sheet, open Contentporter and have to go through the list and select each item individually. This is besides annoying, also error prone. I thought this could be automated. So I created an extension for the SDL Tridion 2011 CTP. It involves a context-menu extension and a ribbontoolbar extension. You can add an item to a release by right-clicking on it. A popup is shown with all the available releases. You can select the release the item belongs to and you’re done. When the release is ready to be installed on the other Tridion servers, all we have to do is create a Contentporter export- and import file. You can do this by clicking on the ‘Releasemanager’ button on the ribbontoolbar. It opens a popup which let you create the Contentporter files. 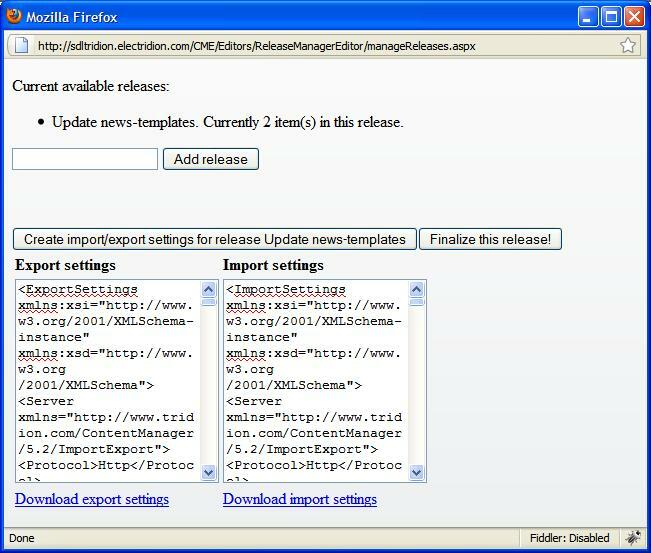 With Contentporter 2009 you can easily use these Export- and Import settings file to create an export and later import this on the next Tridion environment. When you open Contentporter 2009 you can choose from 4 options. If you select the 4th option ‘Load wizard settings from a file’, you can use the just created export/import files to create an export for your release. 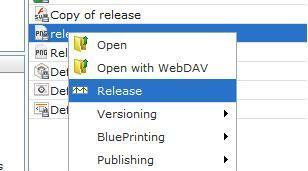 After you are finished with the release there is an option to finalize the release. The items are removed from the Releasemanager DB (Xml file) and placed into an history folder. There is no functionality to restore the history or to look into the history. If this extension is something people need I will update it with this functionality. Also, the layout is just plain…well, there is none 😉 I just wanted this to work. You can download the extension here. (Updated link) There is a howto.txt included with install instructions. You are currently browsing the Albertromkes's Weblog blog archives for October, 2010.